From horror master Junji Ito, the creator of Uzumaki, Gyo and Tomie comes the adorably goofy Junji Ito’s Cat Diary: Yon & Mu! Based on events from his life, Cat Diary shows the ups and downs that come from owning two cats, all drawn in a distinctly Junji Ito fashion! While he’s best known for his horror series, Cat Diary shows that Junji Ito’s not totally incapable of stretching his muscles into other genres. Things kick off with J. and his wife buying a brand new house, but they won’t be living alone for long. J.’s wife quickly brings Yon and Mu, a pair of cats to live with them, and Ito pens some pretty adorable and silly adventures of the acclimation process. 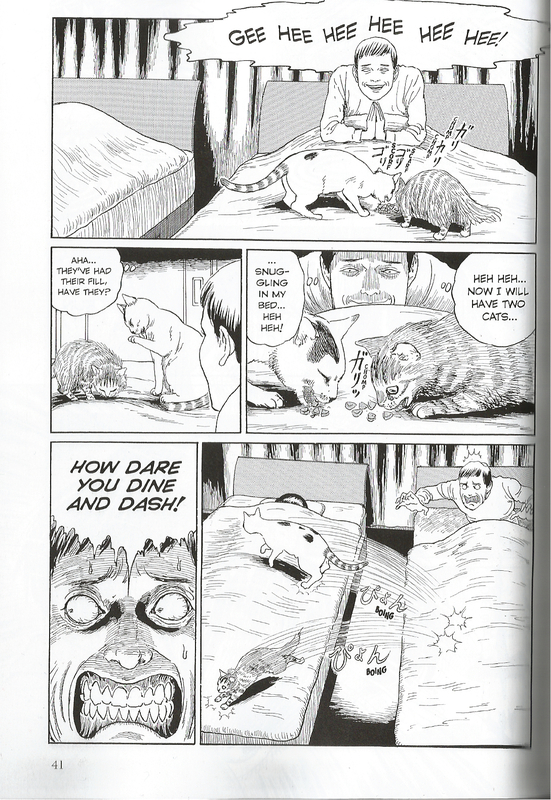 Cat Diary may be a comedy, but it’s still a Junji Ito book and quite a bit of the comedy comes in the form of disturbing reaction shots and demented depictions and his creepy rendering of normal people and daily lives. For example, his wife is depicted with nearly completely white eyes, giving her a rather creepy and unsettling feel, especially when she grins! Likewise J.’s overreactions to adorable kitty antics are tinged with a hint of madness one would expect to see in Ito’s horror manga. Incidentally, this is probably one of the few times I’ve found myself enjoying comedic over reactions, and that’s because they skew away from the typical depictions of such moments. It’s proof that even over used comedic tropes can still be fresh and entertaining in the right hands. 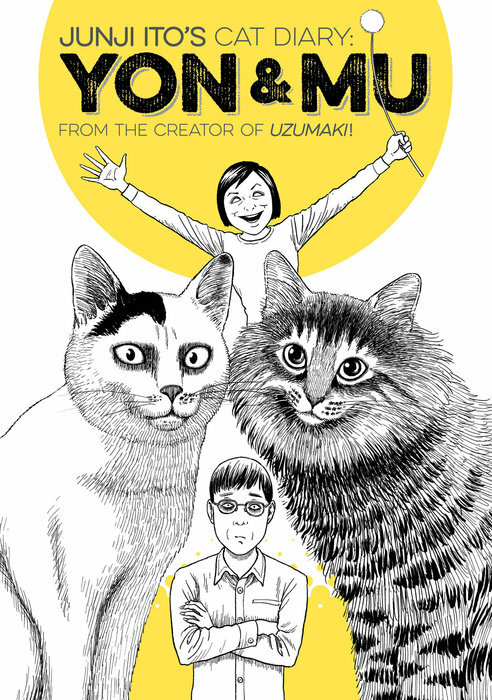 Junji Ito’s Cat Diary: Yon & Mu is a quirky and breezy read. It’s fun and surprisingly short. Fans of Ito’s horror will probably be bummed out that this got published before some of his other works, but it does provide a surprisingly personal look into the creators life and can be genuinely touching at times as well. If you’re a fan of cats or Junji Ito’s other works, you should definitely give this a look. Junji Ito’s Cat Diary: Yon & Mu are available now from Kodansha Comics.